If you are looking for engage on your readers more about your post, you need a make sure your comment section is easy to use, users friendly and protected from spam bots. This is the reason that you should use these awesome WordPress comments plugins to protect and make it easy for our readers to comments. Today, we listed the 10+ Best WordPress Comments Plugins that can help your blog improve comments and protection. These are plugins that will help your readers and protect your site from malware, injections and spambot attacks. These WordPress Comments Plugins can help attract more visitors and commenters to your post thus giving you an engaged group that you can start to network with. Adding the CommentLuv WordPress plugin to your blog is a great way to show your readers that you value them and the comments they leave on your blog posts. With CommentLuv, every comment left on your blog automatically includes a snippet and link back to the commenter’s most recent blog post (assuming the identifying information in their submitted comment form tracks back to a blog with a feed from which the most recent blog post can be scraped). Bloggers love this WordPress plugin because it can increase traffic to their own blogs more so than a traditional comment link from their names can. WP-Paginate is a simple and flexible pagination plugin which provides users with better navigation on your WordPress site. In addition to increasing the user experience for your visitors, it has also been widely reported that pagination increases the SEO of your site by providing more links to your content. Creates a little quote icon in comment boxes which, when clicked, copies that comment to the comment box wrapped in blockquotes. 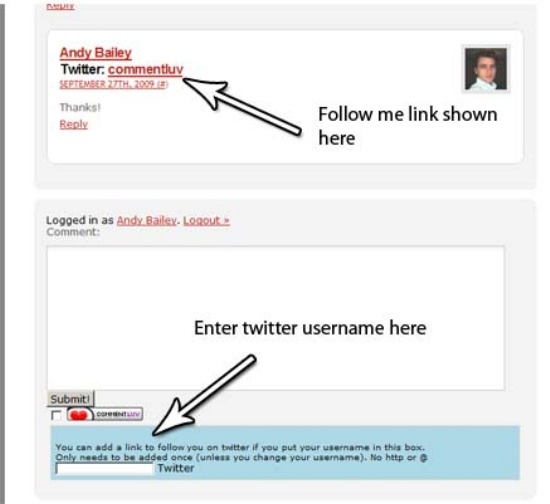 This plugin will add an extra field to your comment form so a user can add their Twitter username. A user configured ‘follow me’ link is then displayed along with their details on all their comments. Mask all external links – make them internal or hide. On your own posts, comments pages, authors page – no more PRCY dropping! Thank Me Later sends ‘thank you’ emails to your commenters. Simply write a message saying thanks and it will be emailed after a time of your choice — 5 minutes, a day, a month, whenever! The Top Commentators Widget a sidebar widget to show the top commentators in your WP site. Adapted from Show Top Commentators plugin at Personal Financial Advice, this widget is easier to manage via the control form (no need to edit the PHP file); additional options are also available to make it more flexible. For each user comment we will create a new dynamic page on the blog, holding the actual comment information. This page will not actually exist in WordPress database, but we will create it dynamically using a WordPress plugin. Twitter Mentions as Comments does exactly what it promises to do – scours Twitter for people talking about your blog posts and silently inserts their Tweets alongside your existing comments. The plugin leverages the power of WordPress’s built-in commenting system – notification, comment moderation, author white/black listing – making Twitter an extension of your blog. Hopefully, these comment plugins can help you build a blog that is easy for readers to comment and protected against spam bots. If you know any plugin that we can add to the list of best WordPress comments plugins, you can put the link in the comments below and we will add it to the list.